Custom hand brushed Japanese calligraphy art on traditional rice papers suitable for framing. 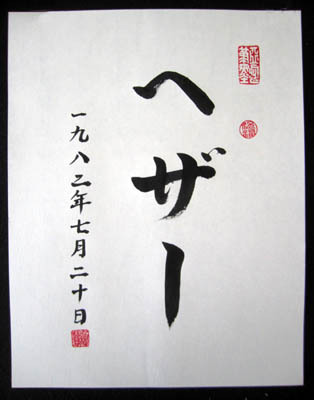 Your name, favorite phrases or poem in Japanese for used of personal wall hanging gifts, tattoo designs or commercial design (see Graphic Design ). Hand brushed orders may range in size from as small 4x6 to as large as 13 x 26 inches. Each Japanese calligraphy order is custom hand brushed so prices may vary based on size & number of Japanese symbols. 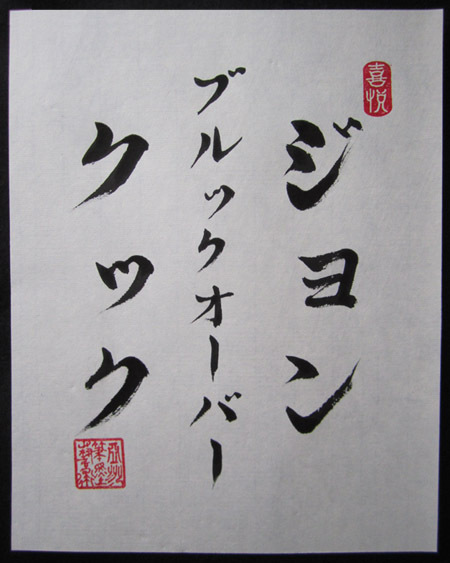 If you would like to get a digital Japanese characters, please see Digital Japanese Calligraphy. How does Japanese language works? How does Hiragana, Katakana and Kanji used? How Is the translation done? Congratulation on achieving your 1st degree black belt! We usually reply in 2 days, if you have not received a reply from us, please check your junkmail folder. You may also e-mail us directly at: order@AsianBrushArt.com Thank you! How does Japanese Language works? The Japanese language uses three different characters system. Though, the modern Japanese text is written with a mixture Hiragana, Katakana and Kanji. However, each writing is used in a somewhat different.Non-Japanese names are usually translated with Katakana characters. The hiragana system consists of 46 syllables and is mainly used to write word endings. Each character represents a sound, it is a syllabic alphabet Hiragana are also widely used in any text materials for children, adults, textbooks and books. It is also used to write Japanese words that are not normally written with kanji. For example, adjectives, adverbs and some nouns, or for words whose kanji are obscure or obsolete. For this reason, usually when translating an English phrase into Japanese Kanji, the Japanese phrase may contain some Hiragana. Katakana is used to represent foreign words & foreign names when Hiragana is used to represent native Japanese words. As a result, when you see a word written in Katakana, you are mostly likely to know that the word has been imported from a foreign language. This is also how we usually translate non-Japanese names into Japanese at Asian Brush Art. Kanji are ideograms, which mean that each character has its own meaning and corresponds to a word. By combining characters, more words can be created. Japanese adopted and borrowed many Chinese characters to write the Japanese language. Nowadays, there are about half the vocabulary of Japanese words comes from Chinese. Many native Japanese words have the Kanji version that were borrowed from Chinese characters. As most Kanji have several meanings and pronunciations. So, it is not always obvious, which meaning or pronunciation the characters are intended to mean/be. Even to a native Japanese speaker. Sometimes Furigana (a Japanese reading aid. They consist of smaller kana printed next to a kanji or other character to indicate its pronunciation) are used for clarification. 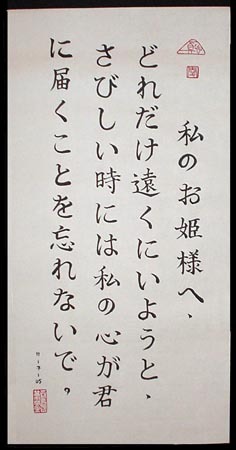 However, when there!|s no Furigana, then it is only the context and the reader's experience can provide clues. This could sometimes make it a little more difficult to translate Japanese kanji. 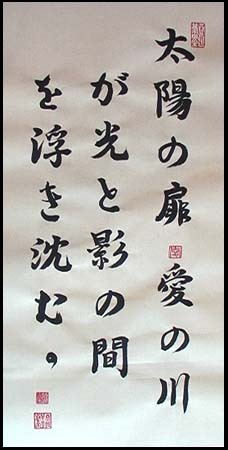 Japanese symbol, Japanese Calligraphy, Japanese letertings, Japanese characters, Japanese Kanji, Japanese Hirokana, Japanese katakana Japanese writing.